Major Crimes returns tonight on TNT at 9:00 EST/8:00 CST pm. I recently had the opportunity to chat with Major Crimes executive producer and co-creator, James Duff, and he brought along a few friends: Jonathan Del Arco (Dr. Morales), Kathe Mazur (DDA Hobbs), Adam Belanoff (writer and producer), Damani Johnson (executive story editor), former Detective Mike Berchem (writer and story consultant) and Kendall Sherwood (writer). This gang really likes and plays off one another. You can tell how well they function as a team. Duff told us that all of the writers work together to conceive and write the shows, although one writer will take the lead per episode. The season is carefully planned out at the beginning of each season and a theme is chosen. The theme of the first nine episodes of this season (seen last summer) was expectations and how life can change when they aren't met. Once the theme has been chosen, the writers can suggest different murder storylines that fit the theme. Then the individual episode writing begins. This season each character's story will be highlighted in an episode. Here's James Duff with Detective Mike Berchem. Duff says that about 70% of the stories they tell come from Detective Mike’s 29 years on the homicide squad. The writers frequently go to Detective Mike to help them figure out how LAPD would approach a certain situation and to brainstorm ideas on how clues can be brought to light. And it's no coincidence that the character of Lt. Mike Tao (played by Michael Paul Chan) is consulting for a detective TV show. GW Bailey was Duff’s acting coach in high school. Duff has known him since he was fifteen years old. Adam Belanoff writes all the Flynn & Provenza episodes (including the fabulous episode of The Closer where Flynn & Provenza leave a body in Provenza’s garage while they go to a Dodger game). Buzz is training to be a reserve police officer and is quick to point out when Provenza takes liberties with rules. Provenza doesn't like that so much. Each character will have a focus episode this season. Sanchez will have some serious issues. 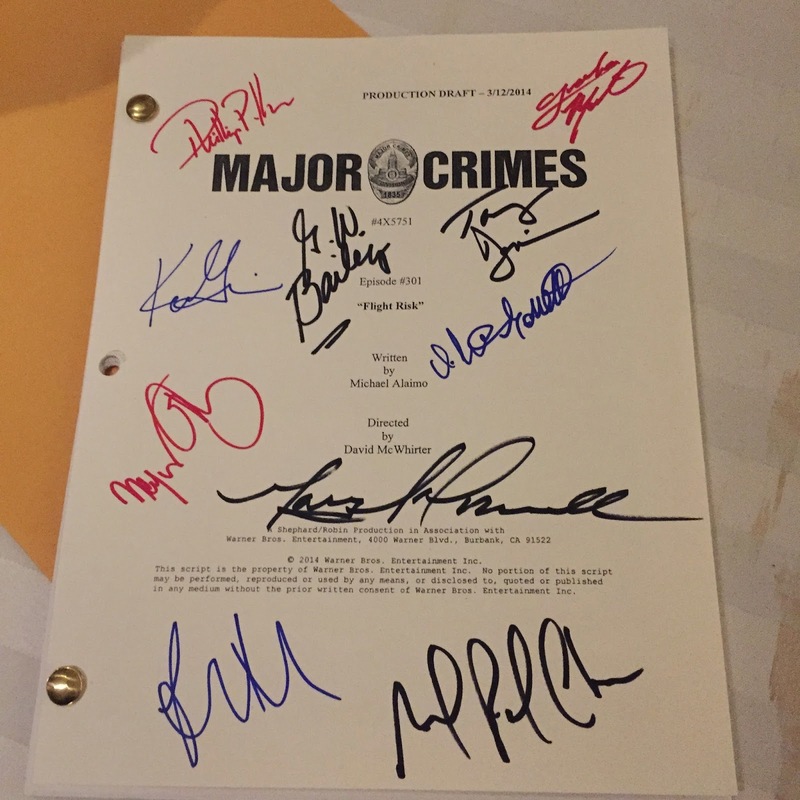 There is a Major Crimes spin-off in the works called SOB, which stand for Special Operations Bureau. Jon Tenney would star as Deputy Chief Fritz Howard with Laurie Holden and Malcome Jamal Warner as co-stars as they chronicle the stories of the LAPD Special Operations Bureau. Duff says when citizens need help, they call the police. When police officers need help, they call SOB. The show hasn't officially been picked up yet, but I hope it will be. Duff will be back tonight for his weekly Facebook chat, which we will recap later tonight. If you missed the first nine episodes of this season, you can catch them on TNT today starting at 11:00 am EST. You can find more from this session on Major Crimes here. Yay, Major Crimes is back. I am a recent convert to the show and was in heaven listening to the writers talk about the show at Bouchercon, AND to meet some of the actors. Such a great event, and it all happened because of Deb, your Mystery Playground creator.